Hyundai Motor America today introduced the redesigned 2014 Equus premium luxury sedan in a North American debut at the New York International Auto Show with enhancements to exterior and interior design, vehicle dynamics, material selection, driver technology displays and advanced safety features. 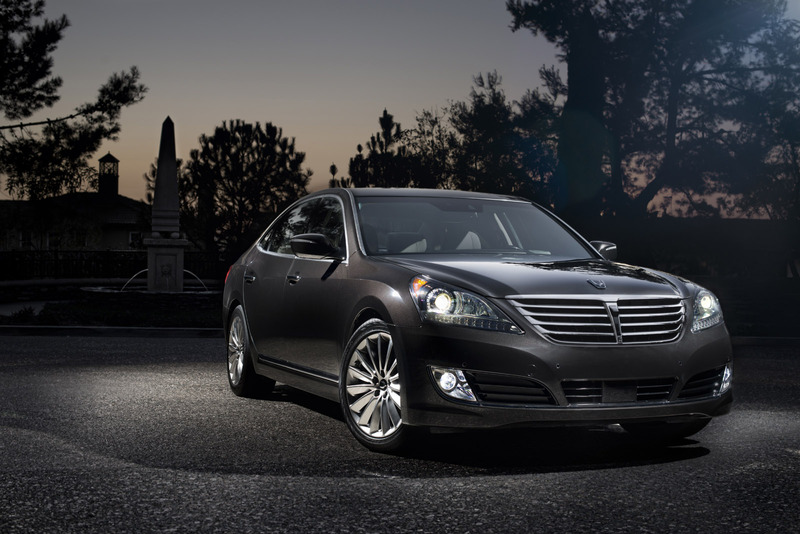 Equus has been an impressive success story for Hyundai; so far this year, Equus is the number-one shopped premium luxury sedan, well ahead of Mercedes-Benz S-Class, BMW 7-Series, Audi A8, Lexus LS, and Jaguar XJ according to industry shopping analysis by Compete. 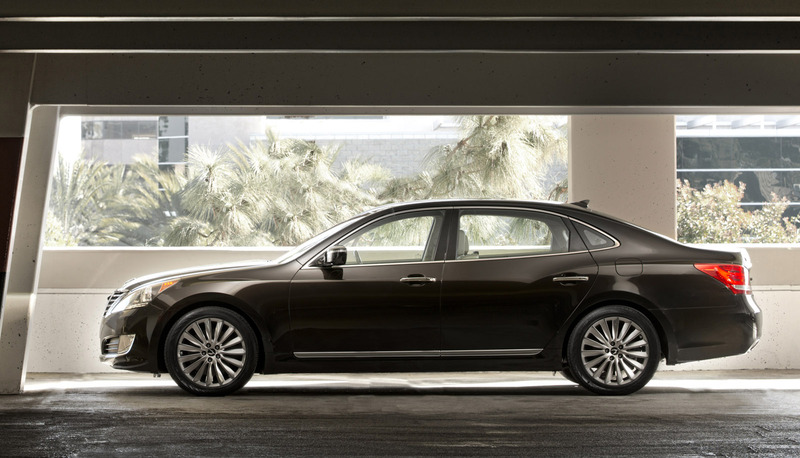 EXTERIOR DESIGN 2014 Equus exterior enhancements convey a premium-sport design message, starting with a new 19-inch turbine-blade alloy wheel design in a polished silver finish that relays motion whether parked or on the open highway. The front grille chrome bars are thinner, with sharper contrast to the blacked-out portions of the grille for a sportier look. The front fascia also has been redesigned, with the former chrome accents removed in favor of a modern premium appearance that includes lower fascia opening strakes. The headlamps offer jeweled design elements and include chrome contrasted with black-out finishes for a distinctive appearance. New LED fog lamps are now standard. Side mirrors have been redesigned for enhanced aerodynamics and tail lamp graphics move to a more horizontal theme. 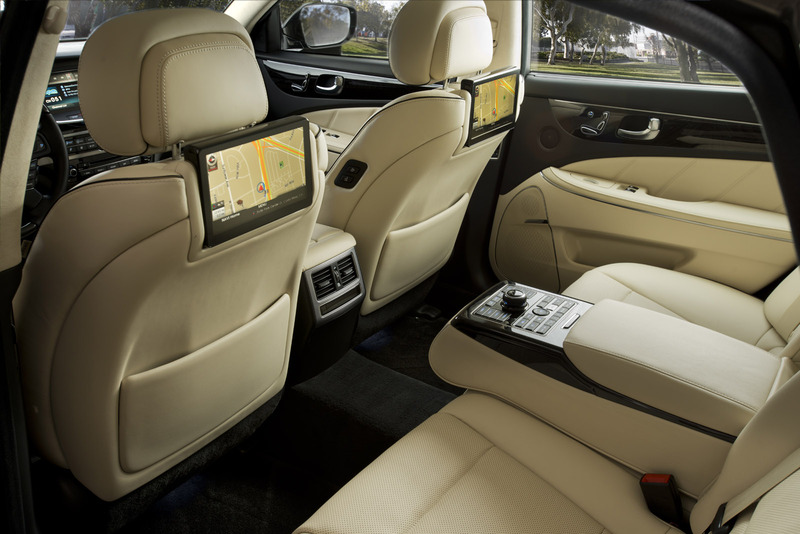 INTERIOR DESIGN Hyundai engineers wanted the 2014 Equus interior to perfectly complement the enhancements to its exterior. Thus, the themes of premium and performance again greet the driver behind the wheel. The entire instrument panel and center stack have been redesigned with more premium materials and an ergonomically-correct layout, with new button iconography for quicker and easier feature recognition. The center console and shift lever reveal more premium material selection and contemporary premium-luxury design cues. Steering wheel control layout has been improved, with new low-sheen button designs and icons. Similarly, rear passengers will enjoy a new rear console and button layout, with available dual 9.2-inch, high-resolution, adjustable seatback video screens to enjoy movies, audio media, HVAC or seating functions. Rear passengers can even search restaurant locations and provide navigation system directions directly to the driver’s navigation screen. 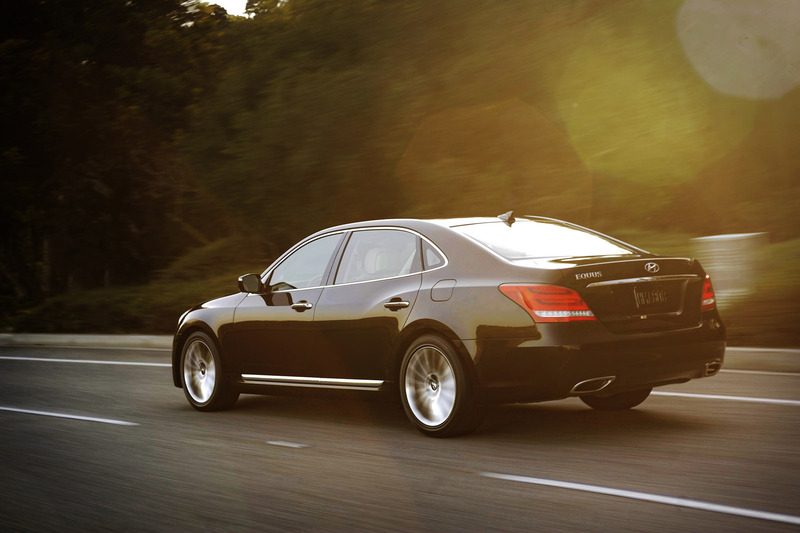 VEHICLE DYNAMICS 2014 Equus driving dynamics also have been revised to minimize traditional ride and handling compromises, with Normal and Sport modes each taking on a more differentiated ride and handling character. The air suspension was recalibrated: Sport mode receives more controlled damping, while Normal mode receives slightly enhanced ride comfort while retaining a well-controlled handling demeanor. The front suspension bushings were also revised to enhance suspension function. For those customers that experience adverse weather conditions such as ice and snow, a new Snow mode function was added to the drive mode system, for both safety and ease of control in challenging road conditions. In urban areas, Equus is easy to maneuver and park, thanks to electro-hydraulic steering and its electronic parking guide assist. While the Equus is large, it doesn't feel over-sized or clumsy due to its 39.6 foot turning circle and variable-effort steering system. On winding country and mountain roads, the Equus benefits from the precise wheel articulation delivered by its five-link front and rear suspension geometry. This geometry is maximized through Continuous Damping Control (CDC), which continually monitors road and driving dynamics and optimizes damping force accordingly. The standard 19-inch alloy wheel and tire package with staggered width tires (P245/45R19 front P275/40R19 rear) offers excellent grip and precise control. NEW AND ENHANCED TECHNOLOGIES All Equus driver-interface displays have been improved for 2014, with a larger, 7-inch Thin-film Transistor (TFT) LCD center cluster display for Signature models, a large 12.3-inch, fully-digital TFT LCD center cluster display for Ultimate models, and a larger, standard 9.2-inch center instrument panel LCD display. New, dual high-resolution 9.2-inch rear seat entertainment monitors have been fitted in place of the former single monitor for rear passengers in the Ultimate model. All of Equus’ new displays are larger and more legible, featuring premium-quality, high-resolution graphics. The Ultimate model’s larger, fully-digital LCD display now offers various driver menus that can be accessed directly via steering wheel haptic dial control, helping to keep the driver’s hands on the wheel for minimal driving distraction. The climate control system now offers three distinct cabin temperature zones for driver, passenger, and rear passengers. The standard smart cruise control system has been enhanced to include a full 0-mph stop-and-start function for use in stop-and-go traffic. The smart proximity key now includes both key-fob and card-key types of vehicle entry for greater driver convenience. Ultimate models now feature an automatic power door closure assist function; once a door manually approaches full closure, a power function slowly and quietly ensures the door is fully secured for peace of mind. Also on the Ultimate model, both rear outboard passengers now have power lumbar support. 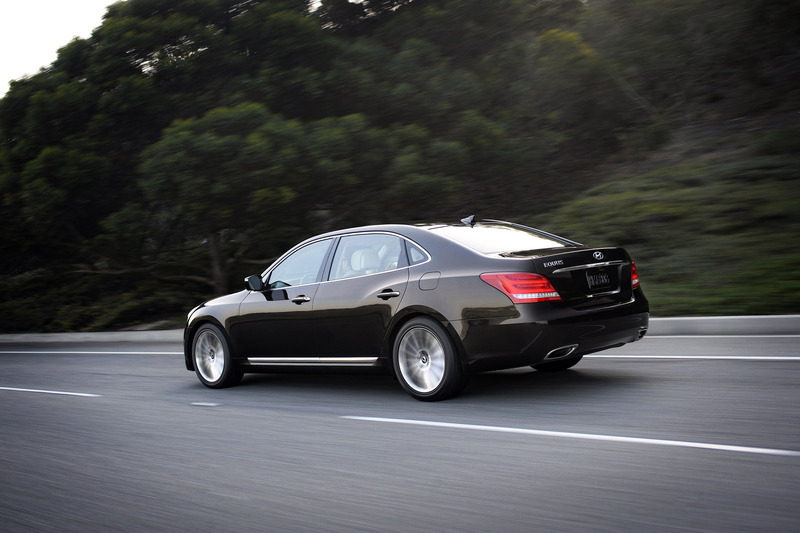 POWERFUL 5.0-LITER TAU V8 ENGINE The 2014 Equus is powered by Hyundai’s 5.0-liter Tau DOHC V8 engine, producing 429 horsepower at 6,400 rpm and 376 lb.-ft. of torque at 5,000 rpm, with a higher specific output (85.8 hp/liter) than its normally-aspirated premium luxury competitors. 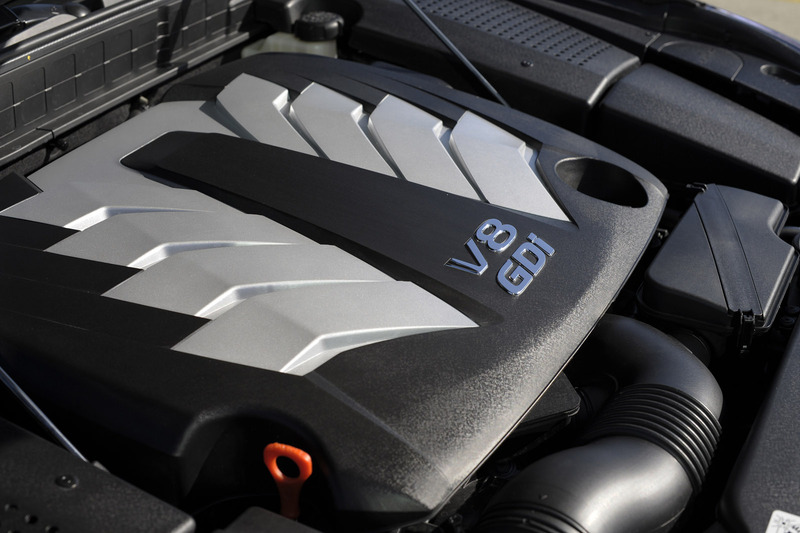 The Tau V8 engine creates this high output level while retaining exceptionally smooth power delivery throughout its rpm range, without the turbo lag and surge exhibited by some forced-induction engines. The 5.0-liter Tau also features direct injection technology. This high-pressure direct injection system (over 2,200 psi) dramatically increases power and torque, while reducing fuel consumption and emissions. The 5.0-liter Tau has a high 11.5:1 compression ratio for greater thermal efficiency and output. It also has a bed plate for improved block rigidity and lower NVH, as well as camshaft carriers and a roller timing chain to improve valvetrain stability. This V8 engine offers premium engine technologies, including Dual Continuously Variable Valve Timing (D-CVVT), a tuned variable induction system, and low-friction diamond-like coatings (DLC) on piston skirts, rings and tappets. Even with these impressive power increases, fuel economy is estimated at 15 mpg city, 23 mpg highway and 18 mpg combined. The Tau V8 engine is coupled with a Hyundai-developed eight-speed transmission with SHIFTRONIC® manual shift capability for enhanced acceleration and overall efficiency. INNOVATIVE OWNERSHIP EXPERIENCE Hyundai will continue to offer its unique ownership experience for Equus customers, including tailored dealership showrooms, “Your Time, Your Place” at-home vehicle demonstrations, “At Your Service” valet service appointments and an interactive owner’s manual app for Apple iPad®. The sales and service experience for Equus is unlike any other in the industry, with a special focus on the customer’s time and convenience. Prospective buyers can participate in the “Your Time, Your Place” valet test drive program, where a specially-trained Product Champion will deliver an Equus to their home or office for a personalized, convenient shopping experience. Equus also features the industry’s first interactive owner’s manual app, providing a convenient and simpler way for owners to become familiar with the full capabilities of the vehicle. Another benefit of Equus “At Your Service” is completely free maintenance services throughout the five-year, 60,000-mile bumper-to-bumper warranty period. 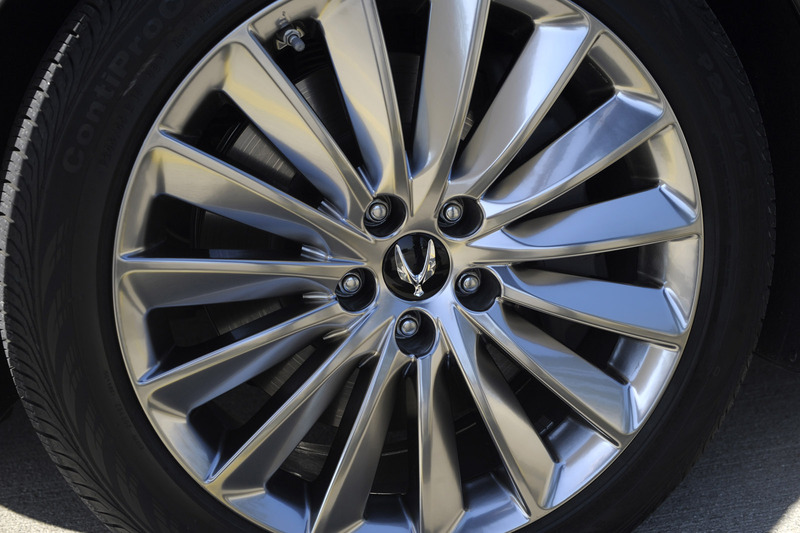 During this five-year period, any maintenance or warranty issue is fully covered by Hyundai, providing exceptional peace of mind to Equus owners. When service is required, Equus owners can schedule their maintenance and service through a simple online scheduling system or from the interactive owner’s manual. 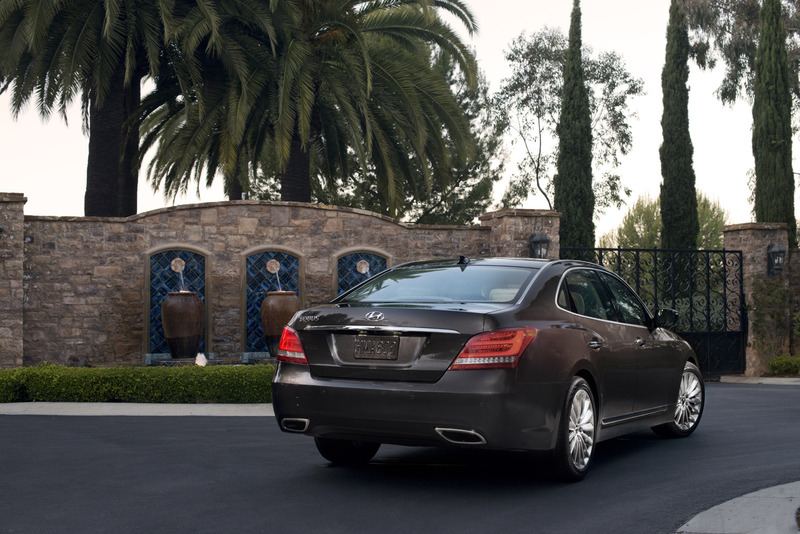 An Equus owner can also choose to have their vehicle picked up at their home or business, with a complimentary loaner dropped off. Once service is completed, the owner again chooses the time and location for the vehicle to be delivered. 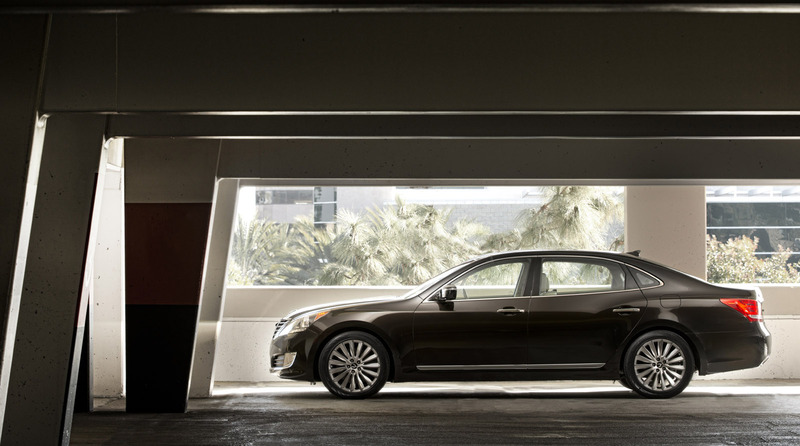 PREMIUM REAR-WHEEL-DRIVE ARCHITECTURE Equus is the third rear-wheel-drive product in Hyundai’s lineup and boasts near perfect front-to-rear weight distribution for exceptional handling balance and more refined steering characteristics. 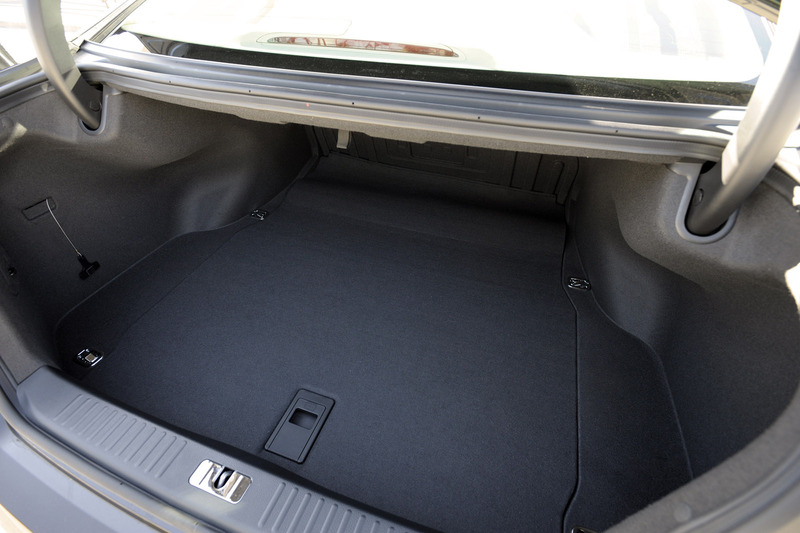 Equus reduces interior noise levels and improves ride and handling with a rigid, lightweight body structure. The use of high-tensile steel in critical areas throughout the unibody provides Equus with significantly higher dynamic torsional rigidity and a lower body structure weight, despite having a spacious interior cabin. 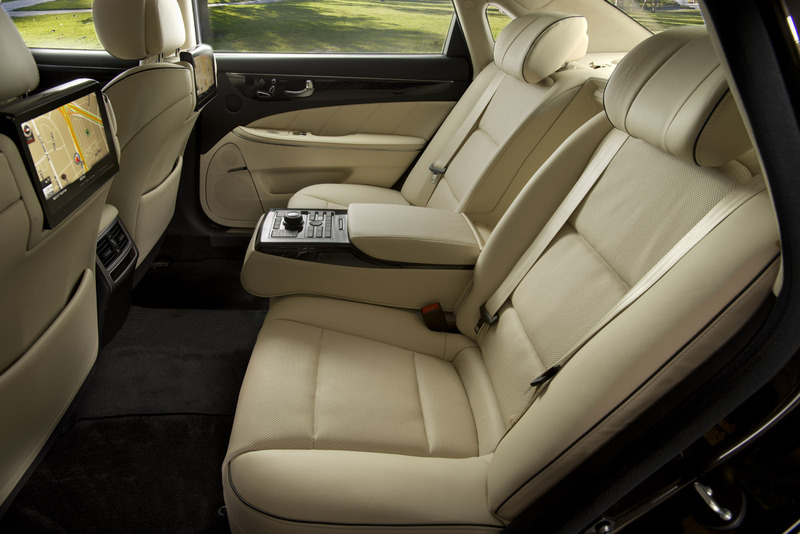 LUXURIOUS FEATURES AND DESIGN The busy executive as well as the couple heading out on the town will feel right at home in the 2014 Equus due to abundant luxury touches and passenger comfort features. This ambience begins with superior quality materials and design layout. The leather upholstery, Microfiber suede headliner, genuine wood trim and leather-wrapped French-stitched instrument panel showcase the richness of the Equus interior. The seats are fully adjustable with plenty of width and support. Thermoelectric devices located in the seat backs and bottom cushions provide control for heating, cooling and humidity. There is ample leg and head room for drivers over six-feet tall. 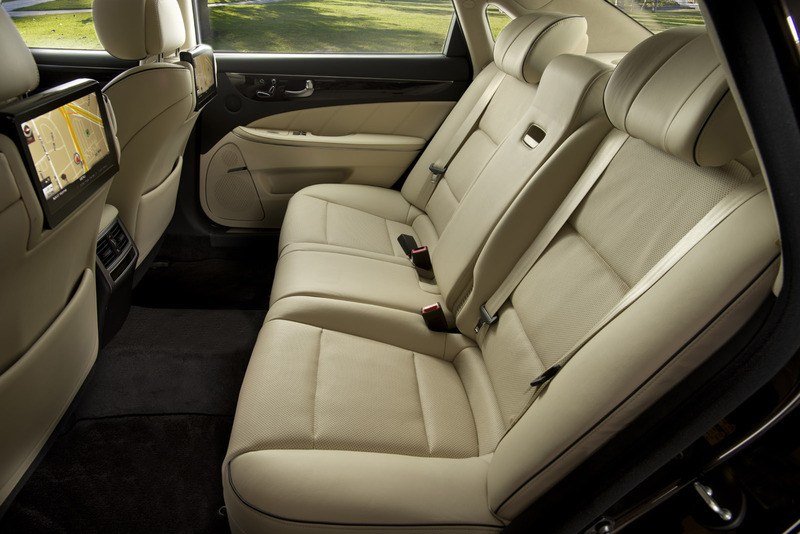 In fact, Equus has more leg, head and shoulder room in the front and rear seats than the Lexus LS460. The driver’s cockpit boasts an abundance of features and premium services. The Driver Information System (DIS) provides navigation, SiriusXM Satellite Radio, HD Radio technology, hands-free Bluetooth® phone system, Blue Link® telematics, and much more. UNCOMPROMISED SAFETY TECHNOLOGIES For 2014, Equus has added a number of new technologies that reduce the potential for distracted driving by helping drivers to keep their eyes on the road and hands on the wheel. A new Blind Spot Detection system is standard, with blind spot vehicle alerts in either mirror. On the Ultimate model, a high-visibility Heads-up Display provides vehicle speed, navigation turn-by-turn instructions, smart cruise control indicators and select driving data viewable well above the cowl plane for reduced driving distraction. When parking or navigating tight urban situations, Equus Ultimate now offers a multi-view camera system that provides an aerial view of the vehicle with split-screen vehicle perspectives for optimized visibility and safety. In addition, all models now include Rear Cross-traffic Alert to help alert drivers of vehicles crossing their path when backing up. Equus also offers a lane departure warning system, with audible and visual warnings activated after a one-second lane departure. The system adds a haptic warning, via the seatbelt, for an extra margin of alert. Further, to help maintain safer following distances in traffic, Equus’ smart cruise control automatically manages the Equus’ speed through the braking and throttle systems to maintain a specified following distance selected by the driver. 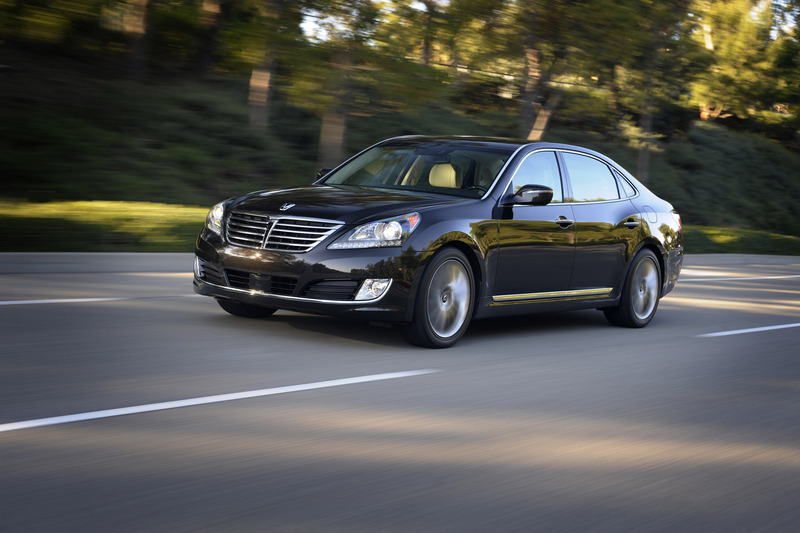 Equus maintains Hyundai’s emphasis on delivering leading safety technology, boasting world-class active and passive safety features to help prevent accidents, and maximize the well-being of its occupants in the event of a collision. 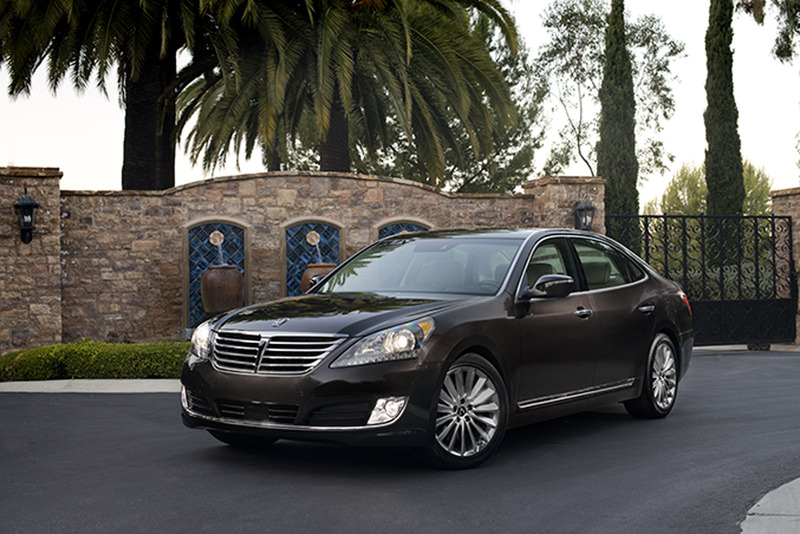 Named a 2013 “TOP SAFETY PICK” by the Insurance Institute for Highway Safety (IIHS), the Equus continues the Hyundai tradition of offering key safety technologies, with features such as Electronic Stability Control (ESC), nine airbags, electronic active front head restraints, lane departure warning system and smart cruise control that monitors and adjusts following distances in traffic. Equus even has a Vehicle Stability Management (VSM) system that optimally manages ESC, the electronic parking brake, smart cruise control and the seatbelt tensioning system for optimal safety. Equus’ total of nine airbags include advanced dual front airbags, front and rear seat-mounted side-impact airbags, roof-mounted side curtain airbags for both front and rear outboard seat occupants and a driver’s knee airbag. 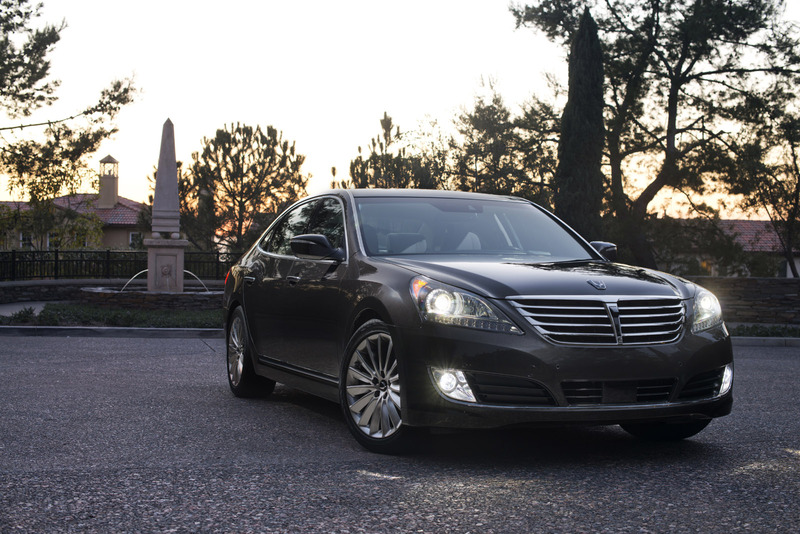 Equus utilizes strong unibody construction, along with front and rear crumple zones, bodyside reinforcements and five-mph energy-absorbing bumpers. The hood also includes buckling creases and safety stops to maximize occupant protection inside the cabin. Equus is confidently brought to a stop by large four-wheel anti-lock disc brakes with Brake Assist and Electronic Brake Distribution (EBD). The 14.2-inch front rotors have four-piston fixed calipers and the rear brakes feature 12.4-inch rotors with single floating piston calipers. LEXICON® AUDIO SYSTEM OFFERS UNRIVALED AUDIO PERFORMANCE Equus offers an ultra-premium Lexicon-branded state-of-the-art audio system featuring LOGIC 7® technology. The Lexicon surround sound audio system includes a 13-channel digital amplifier and 17 speakers producing 598 watts of power in 7.1 discrete surround sound audio. Equus also offers the clarity of digital HD Radio technology, SiriusXM Satellite Radio and iPod®/USB integration. 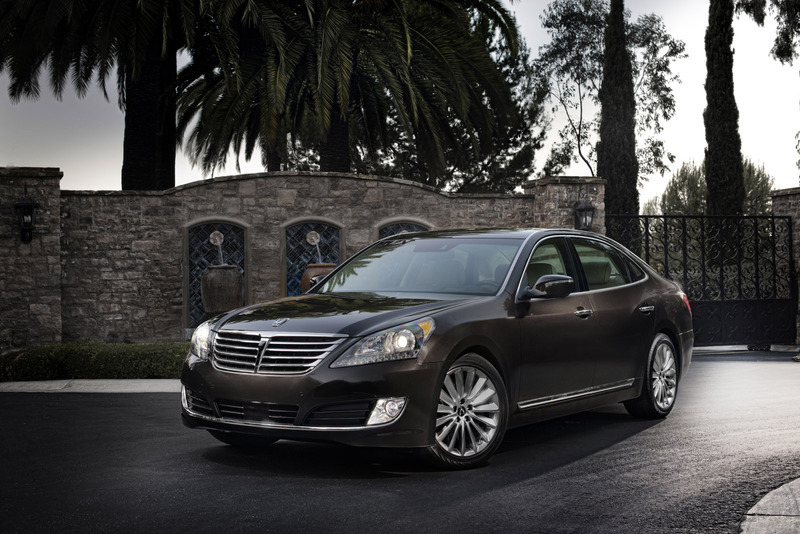 ASSURANCE CONNECTED CARE AND HYUNDAI BLUE LINK® 2014 Equus adds the Hyundai Blue Link® telematics system, with over 30 safety, service, and infotainment features available. 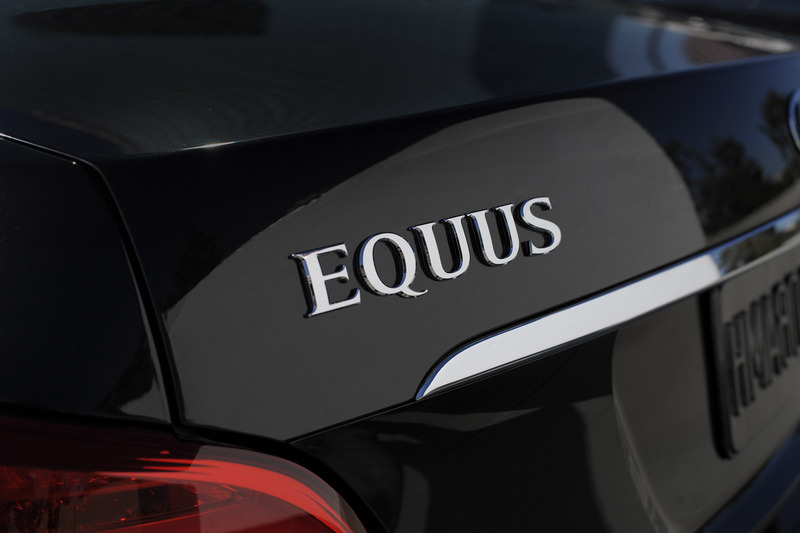 In addition, Equus with Blue Link® includes Assurance Connected Care, a three-year complimentary services suite with critical safety and ownership assistance features. 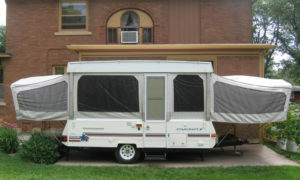 This three-year complimentary services suite even extends to potential subsequent owners during the three-year period. Blue Link® combines safety, service and infotainment features to simplify owners’ lives, reduce stress and distracted driving. 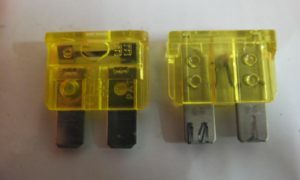 Blue Link brings seamless connectivity directly into the car with technologies like Remote Vehicle Start, Stolen Vehicle Recovery, and Remote Access from the Blue Link mobile application, including POI Search and Send-to-car. Blue Link can be easily accessed from the buttons on the rearview mirror, the web and via the smartphone app. GENEROUS FEATURE PACKAGING For 2014, Equus Signature and Ultimate packages are both so generously equipped that no factory options are available. Both the Signature and Ultimate packages now feature 5-passenger seating, increasing the Ultimate model’s appeal to customers desiring extra seating capacity. 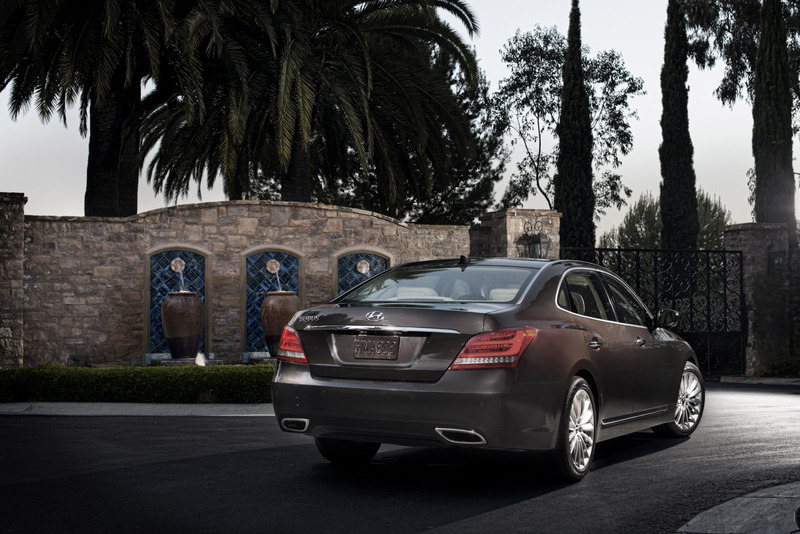 COLOR PALETTE For 2014, Equus buyers can opt for a distinctive new color, Night Shadow Brown, as well as the option of a new Ivory leather interior environment with contrasting piping on the seat bolsters, a sporty yet unmistakably premium interior design element. There are also three new genuine wood accents for the interior: Jet Black with Walnut, Ivory with Ash or Saddle brown with Madrona.